One of the key questions that I wasn’t able to resolve in Killer In The Pool was: given the fact that Tilikum had been involved in two previous deaths, and had been deemed unsuitable for waterwork and desensitization training, why was Dawn Brancheau lying down so close to him on a slideout following the Dine With Shamu show? 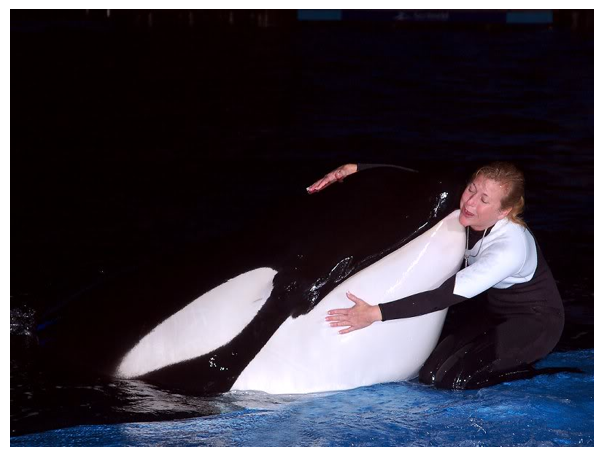 This is clearly a vulnerable position, and she was a very experienced trainer who presumably knew how to take care around Tilikum. So it seems puzzling. SeaWorld repeatedly said that it had very specific protocols when it came to working with Tilikum, but declined to detail what the exact protocols were (beyond that fact that no one was allowed to get in the water with him; being on a slideout apparently was not defined as in the water). SeaWorld also declined to say whether Dawn Brancheau had violated any of those protocols by lying down with Tilikum in that manner. Without knowing the details it was not possible to determine whether Dawn Brancheau was violating SeaWorld’s protocols for working with Tilikum and had made a mistake, or whether she WAS NOT violating protocols and in fact was in fact doing something which she and other trainers had done before with Tilikum. My gut leaned toward the latter: that the position Dawn took with Tilikum on the day he killed her was similar to positions she (and maybe other trainers) had taken with him before, for two reasons: 1) Everyone who knew Dawn that I spoke with, said she was very committed to her job and known for following the rules; and 2) SeaWorld runs a pretty tight ship, and it seemed unlikely to me that Dawn would suddenly be doing something that she and others had never done before (and if she had, how come the other trainers acting as her spotters didn’t flag it?). Lacinak said he’d been told how the attack happened by other trainers who were at the scene Wednesday, when Tilikum dragged Brancheau into the water as she gave him pats and other rewards after a midday show. Based on their description, he said the rules for handling the giant orca that were in place during his tenure had either been broken or changed. SeaWorld–Dawn’s employer for 16 years–has said nothing to dispute his judgment. Thus, the prevailing outside view of what happened was that–experienced as she was—Dawn Brancheau made a mistake that got her killed. Now, thanks to a remarkable set of Tilikum photos, taken by a photographer who is clearly dedicated to documenting SeaWorld’s killer whales, we can start to divine the real truth regarding whether Dawn Brancheau made a mistake, or whether she was simply doing something with Tilikum that she and other trainers had done before (something that SeaWorld management knew had been done before, and presumably authorized or tolerated). The photos are in an album devoted to Tilikum, and were shot over the past few years. You can peruse the whole thing here. But I have selected a series of photos that appear to make clear that SeaWorld trainers had been getting very close to Tilikum on slideouts well before the day Tilikum grabbed Dawn, pulled her into the pool, and killed her (one caveat: I am trusting the photographer correctly identified Tilikum and placed only pictures of Tilikum in this album). 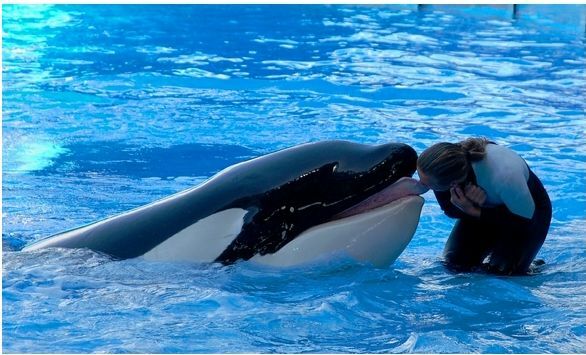 In this photo, the same trainer is engaged in something called “tongue tactile” (which is SeaWorld-speak for a kiss), which I had been told was a practice that had been banned at SeaWorld (especially with Tilikum, one would think). The trainer gives Tilikum a kiss. Whether or not the positions of the trainers these photos are technical violations of SeaWorld protocols related to Tilikum, it is clear that the position Dawn took with Tilikum on the day she died was not an aberration. Lying down with him, getting so close to him, did turn out to be a tragic “mistake.” But getting into vulnerable positions with Tilikum appears to be something that had been going on at SeaWorld for a number of years, presumably with management’s blessing or tolerance (if not, and trainers were sanctioned for the practices these photos reveal, then SeaWorld should say so). So now it seems likely that SeaWorld was allowing, or tolerating, the practice of getting close enough to Tilikum that he could (if he chose) do what he did to Dawn Brancheau. Given Dawn’s brutal and tragic fate, the new key question is: Why? Thad Lacinak also told me that management always warned trainers never to get too comfortable with any animal. How is it, then, that SeaWorld management itself got comfortable enough with Tilikum to allow or tolerate the apparent practices seen in the photos? I don’t know the answer to that question yet. But I do know that there seems to have been a dramatic change in the caution with which SeaWorld treated Tilikum, a change that took place sometime between when he arrived and the time these photos were taken. And the reason I know this is that I recently got in touch with Samantha Berg, who was a trainer at SeaWorld from 1990 to 1993, and was there when Tilikum arrived in 1992, after being involved in the death of Keltie Byrne at Sealand Of The Pacific. She has some fascinating things to say about what management conveyed to the trainers regarding what happened at Sealand, and how they wanted to handle Tilikum. First, Samantha learned from Killer In The Pool (and subsequently reading some of the news accounts from the time): 1) that either Tilikum, or one of the two females he was with (Nootka and Haida), pulled Keltie Byrne into the pool after she slipped halfway in; 2) that the three killer whales actively blocked Keltie from swimming to the pool sides and a life ring thrown to her; and 3) that Steve Huxter, who was there at the time, is clear that in Sealand’s dark seawater pool it was impossible to know which whale was doing what at any given time. Ultimately, it took Huxter and others hours to retrieve Byrne’s dead body. The way I heard it in 1992 at Shamu stadium was that Tilikum wouldn’t give her DEAD body back for hours because he was in possession of the “toy” and it was rare for the females to part with a toy and let him play with it. I was never told that they wouldn’t let her out of the water while she was alive. Maybe some of the senior trainers knew this, but those of us lower on the totem pole did not. To me, it’s a very different scenario thinking of her passing out quickly from hypothermia and drowning and Tilikum carrying her around like a souvenir vs. them actively and aggressively trying to keep her in the water – whether they knew they were killing her or not. Again, I’m just sharing how it was described to me – the drama was played down quite a bit from what you described. The implication was that Tilikum was a victim of circumstance and wouldn’t have acted the way he did if his social structure (note: he was abused by Nootka and Haida) had been different. But clearly, nobody really knew what he did and didn’t do while Keltie was still alive. I never knew that part. When Tili arrived we were given only gross safety instructions, which included: only senior trainers could work him; no waterwork; wetsuits must be zipped up when around him; no dangling objects (except training whistles); must have a spotter when working him. There were no restrictions on inside vs. outside of walls, which pools we could work him in, etc. What is troubling to me is how little I was ever told about his participation in the girl’s death at Sealand. I was told she fell into the pool, became hypothermic and the whales played with her. Few details. Further, I was never told Nootka participated in her death alongside Tili, and I worked around her too. This lack of detailed information was also the norm when accidents happened at other parks. For instance, I remember an accident happening (not sure which one) and all of us were pulled from waterwork for a short time. To this day I don’t know what happened. It would have been nice for the specifics of these accidents to have been presented to us so that we could have possibly prevented it from happening in our pools. I was never shown video footage of these accidents either. My take is that management purposely keep us in the dark for at least two reasons. First, they didn’t want trainers questioning the overall safety of their program, after all, the show had to go on. Second, they probably assumed that if we didn’t really know how dangerous the job was then we wouldn’t be inclined to demand more than near-minimum wage earnings. I was there when Tilly arrived so I remember all the discussions re: putting a trainer in the water or not. I know that Mark [Simmons] argued for it and so did several other trainers. I remember being very conflicted about it – who would volunteer to go in the water with him?? I supposed we could have done it in a large pool where Tilly was on the far side of a pool and the person getting in the water was so far away that Tilly couldn’t possibly get to the person in the time it would take to get out of the water. But, eventually, you would have to take closer and closer approximations until the trainer was definitely in a completely vulnerable position with Tilly. I can see why management decided not to take the risk, BUT they had already taken a much bigger risk by bringing him to the park in the first place. When Tilly arrived, everyone was incredibly hypersensitive about being careful around him. On the first day he was at Shamu Stadium, I saw a trainer walking across a gate (he was on one side, empty pool on the other side) making cooing sounds to Tilly and attempting to play with him . She had her hair down and her wetsuit was tied around her waist and she was standing on a gate between two pools, leaning over to talk to Tilly. I swear, Chuck [Tompkins; who is still with SeaWorld] and Thad [Lacinak] almost exploded on the spot. I can’t remember who, but one of them practically screamed to her to get out of there (probably with an expletive, but it’s been too long for me to remember exact words) AND at that moment both Chuck and Thad decided that the rules around Tilly would be: Absolutely no unzipped wetsuits, nothing hanging for him to grab, and no hair hanging down. My understanding was no lying down next to him EVER – sessions would only be conducted from a standing position. Honestly, at the time, I didn’t know what the fuss was about, mostly due to my ignorance of what actually happened at Sealand. Based on what I thought I knew, I thought they were being over-cautious. So, obviously, they knew more than they were telling some of the trainers. I was never approved to work with Tilly, so I didn’t need to be told how to interact with him – I just avoided him while I was there. What Dawn was doing– laying down in the slide out area with him–NEVER would have been allowed back then. Did something change with the rules when Thad left? Or did people get too complacent with Tilikum? Dawn started a few months after I left, so I never met her, but if the rules changed that much, it could have been any one of us. Like I can’t imagine what she was doing hadn’t been done 100 x’s before – it probably wasn’t the first time someone was laying down in the slide out with him, right? So, basically she was doing water work and he was not trained for water work. Thanks to these photos, we now know that Samantha’s suspicion that Dawn wasn’t doing anything different the day she died, and that trainers had been putting themselves in vulnerable positions with Tilikum, were spot on. So that leaves SeaWorld to answer a critical question that takes us one step closer to understanding how and why Dawn Brancheau died: how did management’s initial caution regarding Tilikum evolve into the seeming complacency and tolerance for close contact with Tilikum shown in these photos? ← Do Orcas At Marine Parks Injure One Another? Thank you Tim & Samantha. That is an incredible recollection and tale. Everything that is in the news talks about how Tilikum was dangerous and no one was allowed in the water with him, yet these trainers are in just as vulnerable positions as as Dawn was the day he grabbed her. Laying on the slideout gave Dawn no more protection than being in the water. These pictures reveal that SeaWorld has allowed their trainers to possibly become victims just as Dawn for many, many years. When I first saw the video of Dawn and Tilikum just prior to her death, I did not get a sense that this was the first time she was close to him in that manner….these pictures confirm just that! After Tilikum killed the trainer at Sealand in 1991, maybe SeaWorld should have taken the time to help Tilikum move back to his native waters instead of manipulating the Icelandic government to believe that it was too risky to put Tilikum back in their water for fear of contaminating their waters with disease and that Tilikum was safer in the hands of SeaWorld. Safe enough to have now taken the lives of two other people and put many more at risk. The money SeaWorld has made and continues to make off Tilikum’s offspring has outweighed the safety of their trainers…that is obvious! Wonderful article u sumed it u in ur last sentence MONEY. AThats all Sea Works has ever cared about. Any for that reason n many others my grandchild willbnever go there. Plus I work in a nail salon this has been the topic all week and I’ll tell a lot of my partons will never set foot in SeaWorld again because of Tilli. This exposes much more than the obvious close-contact that was permitted with Tilikum. It peeks inside the inner-workings of SeaWorld’s deception in order to push the envelope at any cost. Risk mis-management at its finest. Did you think to ask the individual who took these photos for permission prior to using them to prove your point?!? They do not belong to you, and it is wrong for you to make such use of them without permission! Who, exactly, gave you permission to use my photos for this article? I ask that you comply with copyright law and common courtesy and REMOVE all of my pictures from this article. For the record: I do NOT support any of the views in this article, and have NOT given permission to use my photos. This articles’ author is nothing more than a common THIEF and his entire article should be discounted with that knowledge. Apologies, I’m not sure I need permission to post photos from a photo-sharing site that allows unlimited free downloads. I didn’t see any copyright restrictions whatsoever. I will look into it and if the terms on that site include any copyright restrictions I will certainly take the photos down. You may not use Webshots in any manner that interferes with our normal operations or with the use and enjoyment of another user. You may only access Webshots and the Content through the interfaces provided by Webshots. You understand that by using Webshots, you may be exposed to Content that you find offensive or objectionable. Please remove all of my pictures from this article. Use of photos and videos. Millions of people trust Webshots as the place to store and share their photos and videos. Our success as a community depends on our ability to offer innovative ways to display and distribute content. It’s important for all members of our community to remember that all photos stored on Webshots can be downloaded as screensaver or wallpaper to the Webshots Desktop. All photos can also be sent as Photo eCards, posted to a blog or website, and bookmarked. Videos can be shared in many similar ways (although not as downloads). (Emphasis added). That seems pretty clear to me. If the photos shared on Webshots can’t be used, stored, shared, etc., as you suggest, why do all photos have Download buttons, URL links, and embed codes? I think the guideline I cite here pretty clearly explain that photos can be used on a blog. Regardless of the laws of using another person’s photo, it is plain RUDE to use one’s photos without asking first. Well, I understand that is is objectionable to you (not sure how “rude” comes into it) that I used the photos for a purpose you do not support. But the photos are important in the broader context of what happened to Dawn Brancheau, and the question of whether she made a fatal “mistake” or whether SeaWorld was sanctioning close work with Tilikum that happened to kill her (as opposed to another trainer). Her family, at a minimum, has the right to know whether efforts to blame her are justified or not. And if trying to find the answer to that question is considered to be rude by you, I can live with that. It is NOT “rude” to use photos uploaded and hosted on a Photo sharing website! When someone uses a free photo hosting/sharing, it is not expected to be notified or asked for permission. When you are concerned about your photos being used by others on the internet, you do not make them available for everyone’s to use by providing direct links, embed codes and the opportunity to download! When you are concerned about your photos being used, you pay for your own hosting service and include copyright text or watermark your photos. Then you can complain if someone uses them without your permission. Are you going to get offended if someone uses a video you load on youtube? No, it’s pretty much a given fact that the video will be used..because that’s what youtube is for! Photos are no different… get over it. AWESOME. Kudos on some great work here, and to Sam and John for speaking out. People should have no tolerance for a corporation and culture that puts $$$ before the well-being of it’s workers. Shame on them for leaving trainers in the dark about the *true* dangers of working with Tilikum, and all of the other whales for that matter. Shame on Thad for his attempts to pin the blame on Dawn, a skilled and devoted trainer, and shame on SW for not refuting that claim. Here’s a quote from Thad on Good Morning America: “Dawn, if she was standing here with me, would tell you it was her mistake that it happened”. More likely she’d be saying “Why was I permitted to be in such a vulnerable position with Tilikum?”. Right now, perhaps she’s thinking to herself, “Why did I devote my life to a company that had no respect for it?”. SeaWorld’s original approach to Tilikum and Nootka IV WAS over-cautious and justified. When Tili & Nootka were first introduced into Shamu stadium 5-point harnesses were used when working them, trainers had to clip off to a secured line around E pool. Did Dawn get complacent and place too much trust in her relationship with Tilikum, it appears so. Anon. Your statement is likely false. I was in the animal training department when Tilikum arrived, and worked with both he and Dawn. No such devices were used, as far as I know. DB may have become overly comfortable, but it’s obvious from the images that her behavior was rather typical, and not an aberration. Too bad SW never takes the time to fully inform it’s training staff of the inherent dangers of working with large predators. I started for SW the same week John Sillick was crushed, in 1987, and was never told the details of how it happened, his disability, and Orky’s poor eyesight. It, like all incidents, was swept under the rug… and maintained behind a cloak of secrecy. Now, thankfully, that cloak is being lifted. JV – I personally witnessed the use of the clip-off systems at SWF, OSHA was also notified of their use during their investigation. Whether or not these devices were used long-term or not I cannot say but they were used, at least once. Anon. Fair enough. I defer to your eyewitness account, and will follow up with JJ and SB on this. Thank you for sharing. It’s sad that anyone could die like that and I extend my condolences to her family. That said, why is it we are too arrogant too understand that these beautiful sentient beings were not put here for our entertainment. These are self aware mammals that are entitled to live their lives without our need to dominate and exploit them for profit. Because of places like Sea World there are annual mass slaughterings of dolphins in Japan. Frankly I think places like Sea World and any other organization that takes an animal from its rightful place on this planet should be shut down and its doors double locked. Aquariums, zoo, animal theme parks, ect, are included in this list of places that should close its doors. It sounds to me that Sea World was negligent for many things concerning Dawn’s death. There definitely should be an investigation that goes deeper because I’m sure that all trainers sign a release form when hired on. So if they (Sea World) withheld any information or pushed to handle Tilikum in a way that he shouldn’t have been handled then I also hope that Sea World is sued to the extent they can be sued. I’m sorry for ranting but I’m not sorry for my beliefs. to work with the whales on ledges and shelves. So it was common to do so and obviously not part of a safety protocol. 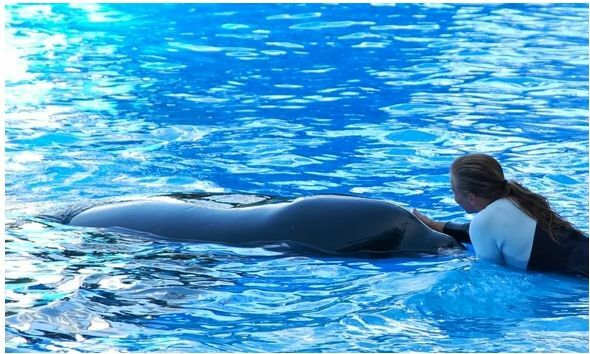 Another point to note – former SW trainer Lindsey Rubincam who now works at Marineland France was pulled underwater by her pony tail by a juvenile male whale, after this incident there was a period of time where pony tails were not allowed…but I don’t know how long. For Anon, and the orca community, in general. The link below is for Orca Tracker. It is likely the most comprehensive interactive map (about orcas) that exists, with links to authors (like Tim) scientists (Ken, Ingrid, Astrid), websites, videos, articles and quotes from ex-trainers, as well as captive orca information. Works on iPhone, and is a work in progress (growing). Thanks JV, that’s a great resource. I have a question – regarding Daniel Dukes, SW had stated there were no injuries on him as the result of Tilikum but I had heard that Daniel’s groin was bitten, and that a piece of his anatomy was recovered from the pool. Is there any truth to that or merely internet rumor? Sea World wrote Daniel Dukes off as a drifter, and minimized his injuries. This seems to be standard operating procedure after an event; minimize it and activate the public relations team. Use personal attacks against anyone with a differing opinion, or evidence to the contrary. In this tragedy, the automatic 911 call (that goes out to OCSO when the alarm is sounded) was delayed for 27 minutes by Sea World’s dispatch operators. This was presumably so park guests could get escorted out of the area (and not made available to police), and trainers from the other areas brought in. The official OCSO report is dominated by trainer testimony, and only a couple of non-SW employees. It was a “shaped” investigation. Remember the initial press conference after DB had been killed? OCSO stated that a trainer had slipped, fallen, and drowned. It was only after the public didn’t buy it, did SW come back out, correct the original announcement, and say she was pulled in. Then Thad was quickly deployed and started blaming DB, and also inserting the pony-tail theory (over and over). By the way, all of the former trainers I’ve spoken to (5) believe it was an arm grab, and not a pony tail grab. This is based on available video evidence. A pony tail story is an easier fix when dealing with OSHA. The policy change is simply that “female trainers must now wear their hair up in a bun”, which has already been implemented. SWF Regular mentioned Lindsay getting hair pull in the past (true). Thanks JV for the reminder and quotes, after all this “slight of hand” by SeaWorld its nice to get some confirmation. Hi Anon, thanks for your info. I never saw anything like this in use while I was at Shamu stadium, either before or after Tili’s arrival. However, that does not mean they never tried to test a system like this, or that a test system wasn’t demonstrated to OSHA or reporters. But it was never implemented as part of the regular safety protocol for working with Tili, at least to my knowledge. Thanks SB, again, I can’t comment on how long it was used..only that it was used around the time both Tili and Nootka arrived at SW. I saw it in use before Tilikum and Nootka were introduced to shows if that helps and maybe this was a trial or something. I know that I saw it at least a couple of times. I wish my memory was a bit better in this regard. The ONLY mistake Dawn made was having her ponytail floating right in front of Tilikum. Otherwise, all of the stolen photos show that the physical contact given that day was no different that day of the accident. By the way Tim, how old are you? 5? Get these stolen photos off of your website. Grow up. If you want photos to post, take your own. If I am somehow mistaken in using photos that Webshots explicitly says can be posted on a blog, I would be happy to take them down. But so far, no one has demonstrated that to me. Not sure why this subject always seems to inspire personal attacks, rather than reasoned discussion. In all likelihood, it was an arm grab. It’s interesting to note that Thad Lacinak (above) based his knowledge of the initial grab on “other trainers who were at the scene”. There were two at G pool helping Dawn conclude her relationship with Tilikum. It is clear that safety spotter Jan Topoleski didn’t see the initial grab either. So, what trainer DID see Dawn get taken down???? As SWF Regular stated above… SW has dealt with pony tail issues in the past. 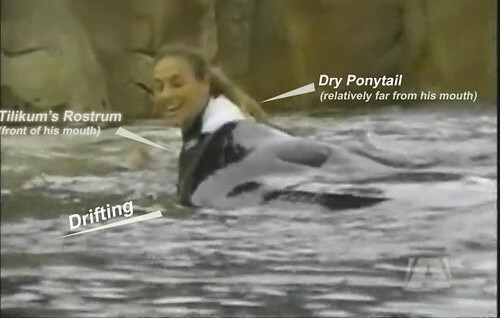 Plus, it was obvious that at some point during the brutality Tilikum yanked DB by the pony tail, as she was scalped. Tilikum did NOT grab Dawn’s ponytail. Eyewitness testimony and the OSHA report deemed that report was false. This was a lie by Seaworld. The actual evidence clearly shows the “ponytail theory” was false. Uh Tim, there is a bit of difference between “using photos on a blog” and rehosting them on said blog without giving credit/asking permission. FAS.org was nice enough to gimme a heads up on this when I was younger. Webshots has the html tags on the lower right for sharing images. Thanks. I did give full credit, calling the photo set “remarkable,” and linking to it multiple times. I don’t think I left any doubt about where the photos came from or who took them. On your second point: in addition to the HTML tags there is a big green “Download” button. I am sorry that using the photos to look a little closer at the question of how Dawn Brancheau died makes SeaWorld fans uncomfortable and unhappy. But the bottom line is: if you post photos on a photo-sharing website, they will be shared, and I believe they are an important piece to a very complex question. You do a great job Tim! Please keep the facts coming! During the time when Corky & Orky were transferred to Sea World their prior trainers were interviewed. They plainly knew the risks of swimming with orcas & what they were up against. I don’t remember what was shared about the female. They did speak extensively about the male declaring that he was a real danger. His personality could only be described as being “gruff”. A few years later AFTER Tili had been with Sea World for a number of years trainers were again interviewed stating that being a trainer meant “taking our life into your hands” each time you entered the tank with a killer whale. To illustrate this they mentioned an enormous bull (Tili) who was the subject of a standing bet. Five thousand dollars would be paid to the trainer who would get in the water with Tili and swim from one end of the pool to another. So far not one trainer has taken up the bet. I’ve also examined many of the photos on many different sites and have seen a very large amount of phots taken of trainers on slide outs with Tilly in various highly dangerous positions. As for MS. Brancheau There’s a photo of her laying on the slide out with her head inches away from Tilli’s open mouth. Her head looks so tempting. It looks nearly impossible for him to refuse and so he didn’t. The rest is history. Orky held a trainer on the bottom of the tank for long enough time that when he was finally distracted and she was pulled out she was not breathing and had to be resuscitated, She had been practicing a pectoral fin ride. This was something everyone assumed the whale tolerated well or even enjoyed. I spoke with her when she returned to work. She said she didn’t think Orky was trying to kill her but was “asserting his dominance” over his space. I hated that the two whales left, but I assumed they would be “better off: at Sea World. Both are dead now. leading to death, and dismemberment. I’d like to know if VIPs were the reason that DB continued to stretch this session with Tilikum, which began heading South after he didn’t hear the bridge for his perimeter pec wave. After that, he looked slow and frustrated. There is no doubt it was a deliberate and willful attack by Tilli and given the photos available that Dawn truster her relationship with the animal. What I find disturbing, for the witnesses not me, is there are differing accounts of how she was grabbed. Some are consistent and some contradict even themselves in what they stated in interviews with various media outlets, in statements to OCPolice and OSHA. I’ve seen the same person claim Dawn and Tilly were laying in the water together and he suddenly took off around the pool and when he came back he jumped and grabbed her by the head and shook her around before diving into the pool. Yet in another statement never mentioned the pool lap but said he grabbed her by the waist and shook her, an account that was repeated in another interview. But honestly how those people remember anything coherently is beyond me, they witnessed a horrifying and traumatic incident I’m sure the details are blurred in some cases or indelibly etched in their retinas. There is one thing that concerns me about using the above photo to disprove the “ponytail theory” and to subtely discredit Jan as seeing the “take down”. Highlighting the ponytail as “dry” so therefore could not have been floating in the water is misleading considering that according to the autopsy Dawn’s hair was 43cm long. The position of the whales head hides the full length/view of her hair so there is no way of knowing if the ends of her hair were floating in the water or not…but as I have hair not quite as long as her I can guarantee if I was lying in knee depth water, in that position at least the last 5 or 6cm of my ponytail would be floating in the water. Having said that I think you can safely say that given her injuries and the more common witness statement that he grabbed her by her arm or shoulder and it does appear that her arm is in his mouth, I think it’s right to conclude “the ponytail” is NOT what he grabbed. From the photos, it’s obvious that on the day she died Dawn was doing something that had SW’s prior approval or she would not have been doing it in full view of the other trainers and spotters! 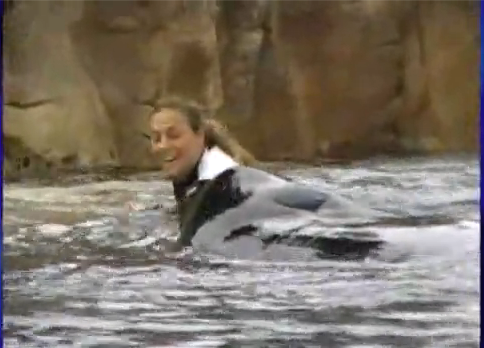 Also, since other trainers were photographed in positions that cry out “tempt me, tempt me” up close with a dangerous animal in the water prior to the incident, SW clearly condoned such closeness which seems like an insane approach to take given Tili’s prior history of aggressive behavior. The only reason SW would have condoned such close interactions between trainer and mammal would have been because of their appeal to the public (“ah, how cute, look at those two, they are so lovey dovey”) and because of the huge profit they make off of these shows. This point is, in my mind, what “Blackfish”, that I saw yesterday, left out: how does it feel, very simply, to have such a huge beast obey you and let you pat or kiss it? I am quite sure it is the same with the people who privately own lions, bears or chimpanzees or what have you, or even smaller animals. This idea that you have been able to establish a special connection with such wild and dangerous creatures. Now I’ve always been fascinated by these huge mammals, and I guess I understand the drive, but ultimately, I know it’s not good for them and for me. It seems pretty cut and dried to me.I live in Orlando and I’ve seen Tili 50+ times and have family members who are SW employees. It’s clear trainers are not allowed in the water with Tili. A SLIDE OUT IS IN THE WATER. Tili is beyond huge an jumps up on the slide outs with no effort at all. To even consider being anywhere within his reach is potential suicide. SW allows the rules to be pushed as evidenced by the “stolen” photos. If they are capable of killing whales, polar bears, walruses and other large mammels a human seems like a light snack. Tim, I don’t have the time to read through everything, but I did read some of the stuff from SB. What’s your opinion? Sorry that I don’t have the time to just read through it all myself! Having seen the video of the “Dine with Shamu” show immediately prior to the attack I’m inclined to believe that it was standard practice to get that close to Tilikum. The whole show is up close and personal – the main example being when DB had her back to the diners, was bobbing to and fro and then feeding him fish (I’ve not linked the video as some bloggers dislike this but will if it’s requested). DB was in very easy reach of Tilikum throughout the show. 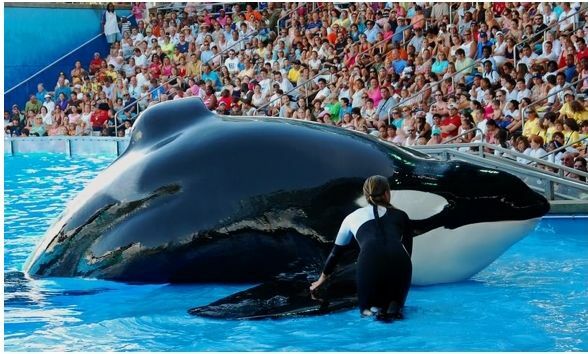 If there were such safety protocols in place then surely Tilikum was not a suitable candidate for the Dine with Shamu show in the first place? 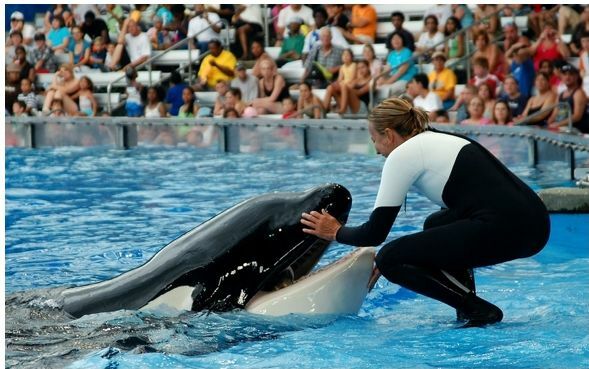 Ok, ok.. maybe she moved in the wrong way, or her breathing was not quite right, or her hairstyle wrong… but as much as Seaworld would like to blame DB the truth is that THEY put her in danger by allowing Tili to be part of the intimate Dine with Shamu show in the first place. The way we interacted with all of the whales constantly evolved. This is normal. So of course they interacted with him differently when he first arrived in 1992 until 2010 and beyond. You base this evolution based off of individual behavior of the whales in specific scenarios. Dawn was not doing waterwork, standing, kneeling, laying on those ledges covered in water is NOT waterwork. She was not breaking any rules or protocols. Not everyone would be or should be privy to any and all details about a whale including their past UNLESS you are actuallly approved to and are working with/swimming with that whale. A CEO of a company is not going to give details of private meetings to people who are new to the company or a low level. It just doesn’t work that way and for good reason. You have to be a certain level of experience to even fully understand some/most scenarios. Lower level trainers would have no say so whatsoever in the decision making regarding the conditioning of waterwork especially for a whale like Tilikum- this would be reserved to only the most experienced trainers. Finally, working in close proximity to any large dangerous animal has its inherent risks. When it goes bad, it should not be judged as complacency which tends to be the norm. People feel its fine until tragedy strikes and then they say judge it or her as complacent which is not accurate or fair. There is no doubt in my mind that with her experience she was fully aware of her environment but unfortunately he made a choice that any animal can make at any time because they are free thinking animals and she should not be judged by that. Even after this tragedy happened I needed to put myself in very vulnerable positions everyday with the whales to give them proper husbandry care specifically very close proximity for teeth irrigation. If I were to be grabbed and dragged under and killed would I be blamed as complacent? John: just a quick response. The post says nothing about Dawn doing waterwork. It takes a look at SeaWorld’s assertion (made initially by Thad Lacinak and then repeated at the OSHA trial) that Dawn Brancheau died because she made a mistake by putting herself into such a vulnerable position with Tilikum. Instead, what seems apparent is that Dawn was interacting with Tilikum in a way that was common, or at least not unusual. So clearly SeaWorld was tolerating trainers putting themselves in “vulnerable” positions with Tilikum. As you say, the protocols for interacting with any given whale change and evolve. And clearly what SeaWorld would and would not allow with Tilikum changed dramatically from when he first arrived at SeaWorld, to allow much closer contact with Dawn and other trainers. In my view, that turned out to be a tragic mistake on SeaWorld’s part. Yes, it is true that any whale can make a choice and cause injury, even death (like Keto). But Tilikum had a very different history than the other whales at SeaWorld. And I would argue that a whale with his specific history should not have been given the (easy) opportunity to make the deadly choice he did. Yes, that is with the benefit of hindsight, and would be a less legitimate point of view or criticism if Dawn Brancheau was the first person Tilikum had killed. But she wasn’t, she was the third. So that makes SeaWorld’s handling of his protocols, and their “evolution,” open to criticism. SeaWorld apparently agrees, since the protocols for interacting with Tilikum are now very different than they were when Dawn Brancheau was killed. Given that Tilukum had been involved in two previous deaths it is hard to see how SeaWorld’s tolerance of the sort of close contact that killed Dawn can be seen as anything other than corporate complacency. Amazing that people can still honestly think that these beautiful Orcas belong n captivity is money hungry or just plan stupid. These are Gods’ creatures and are meant to roam the oceans as they see fit. And the way you got those whales, may god forgive you all. I vote Howard Garrett for president, he seems to have his groove on!! Just watched Blackfish today. It led me searching the internet about this matter and to your website. Please keep up the good work. People need to realise that orcas don’t belong in tanks and aquariums anymore a human being belongs in a small cage. Their definition of water-work needs adjustment. The way Dawn was on that submerged shelf she was “in the water” with the Orca and totally available to him. I think the instinct to mouth prey and toss it around may be why the attack went on the way it did. The accumulated frustrations of his life in captivity led to the initiation of the attack. Tilikum is the exact example of why Orca do not belong in captivity. Neither do belugas or dolphins. They are social beings who live in family units and have a vast range to forage for food. Elephants, Apes are the same kind of creatures. Maybe no animals should be on display, but certainly the larger, social species should not be captive. I stumbled upon this article after reading about and subsequently researching Daniel Dukes and his mysterious demise… Can anyone elaborate on his death any further than what is available through “google”? The way in which he was in contact with Tilli, when they found his body, seems oddly interesting to me. Any thoughts on the significance of his body being draped across Tilli’s back (is this even accurate?)? That being said, has anyone read about theories surrounding the placement of his body? Tilikum did have Dukes’ body draped across his back. Wild orcas have been observed draping dead salmon or seaweed across their backs. I must question why sea world pays so much for whales and cares much less for human life? My number one question would be is SeaWorld hiding something? I think that SeaWorld IS hiding something.And also I thing that tillicum sensed something wrong with dawn maybe like dawn found out what SeaWorld was hiding it could be anything and also I was reading that killer whales hold sharks and whales under water upside down for 15 minutes so that could be why tillicum held Dawn down for minutes at a time then letting her go and while she is trying to resurface he is grabbing her foot. Also I think that if Dawn did not scream then maybe tilikum would have not go so rough with dawn when she screamed.Dawn Brancheau really did help me beloved in God again, there for a few years I stopped believing in God then dawn helped me believe in God again. I don’t trust people but when I seen how dawn would smile when she WA doing a show I would just smile. I’ve never been to SeaWorld but I love watching videos of dawn doing shows. The animal is called a killer whale. Anybody dealing with animals knows there is always a chance of death or injury. That employee made a choice…the choice of getting too cozy with the animal. Most likely she loved him. Late reply, but on the topic of the Webshots image copyrights: the (currently defunct) page that you quoted earlier in the discussion to defend the use of the Tilikum photos was saying that it’s possible to save photos from Webshots and post them on various kinds of websites. That’s what they meant by using the word “can”; that it was possible for people to do that. But this was meant as a reminder for uploaders who share their content, and it was not a permission slip for people to do anything they want with the images. Just because something is possible to be done doesn’t mean it’s necessarily _allowed_ to be done. And that quote certainly didn’t give you the permission to pretend that this person’s photos are in public domain. Copyright law still exists. If the copyright owner of the photos says you are not allowed to use these photos, you’re obligated to cease by law. Yes, those photos of Tilikum are informative. But when you use the images without permission and try to find loopholes that would give you the justification to post the images against the photographer’s wishes, you are acting in a very unprofessional and rude fashion. If you do this kind of thing to someone who has the resources to go for court battles, you will end up sued. Also, it seems like your actions have turned those photos into orphaned works. The photographer removed their Webshots account (presumably to prevent people from using the images the way you did), and this article or the slideshow don’t actually credit the photographer by any sort of name or alias. There are some dead links but no mention of the name. It’s only possible to see the person’s username by reading this article’s comments section, which has the photographer’s futile request to respect their copyright. And if someone were to link directly to the Slideshare page, nothing in there gives any indication of the photographer’s name; neither the slideshow nor its description mentions it. You have not given adequate credit to the person whose works you’re using, and you’re using them against the person’s wishes (and against the copyright law). Since you’ve written a lot of highly insightful articles on the topic of orcas, I’m rather disappointed by how you handled this. That’s a “slide out “she is seen with him on in the very last frame of the home video ? It’s certainly not a platform. She appears to be in the water with him. Frames before that she is seen in a semi squat leaned over position further away from him but still in 2-3 feet of water. Is it speculated that she is there because he pulled her off the “platform” and she freed herself and is attempting to back away or is it thought she put herself there? The platform is indeed a slide-out (was using a basic description rather than a theme-park word which would require further explanation). It is understood that she put herself with Tilikum on the slideout/platform as being in very shallow water with him was not banned or considered “waterwork.” Following the tragedy, trainers are much more restricted in how closely they can approach him and under what circumstances.